A Level 15 Soldier taking down an enemy player, leveling up, and unlocking his ability! 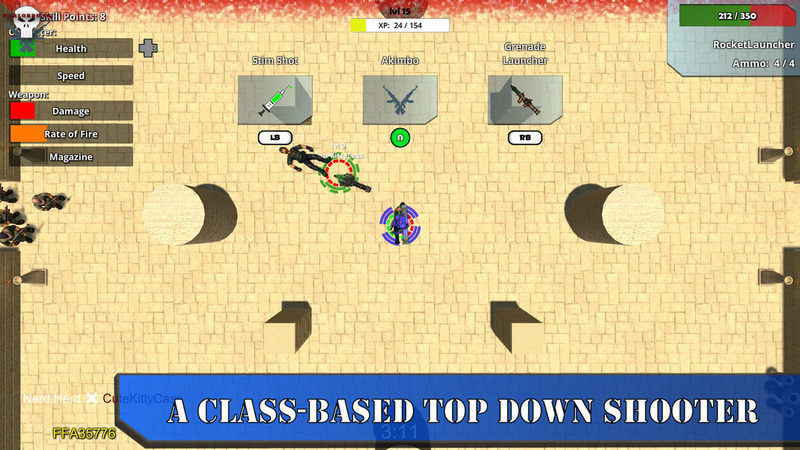 a Cross-Platform Top-Down-Shooter with MOBA like elments and class-based warfare. Players can fight together or against each other in numerous arenas on PC. Versus modes feature short action-packed rounds that give you that beloved "one more" feel. Before each match, players choose from 4 character classes to play as for the duration of the match. 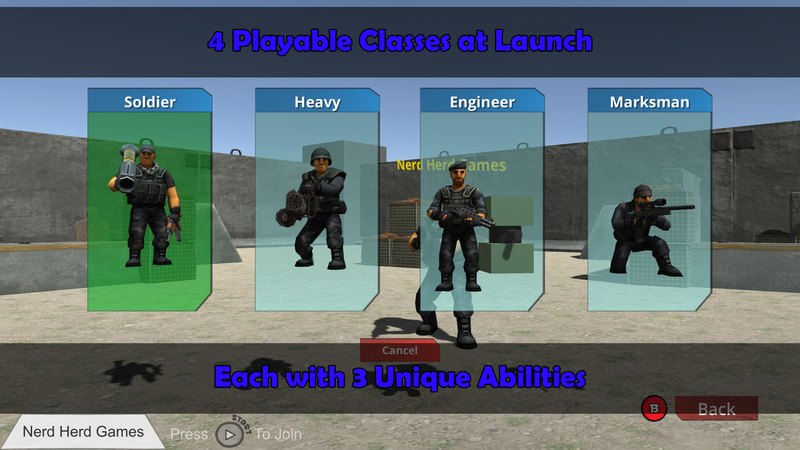 The four classes are: Soldier, Heavy, Engineer, and Marksman. Each class it's own unique base stats, 3 abilites to choose from, and unique primary weapons. 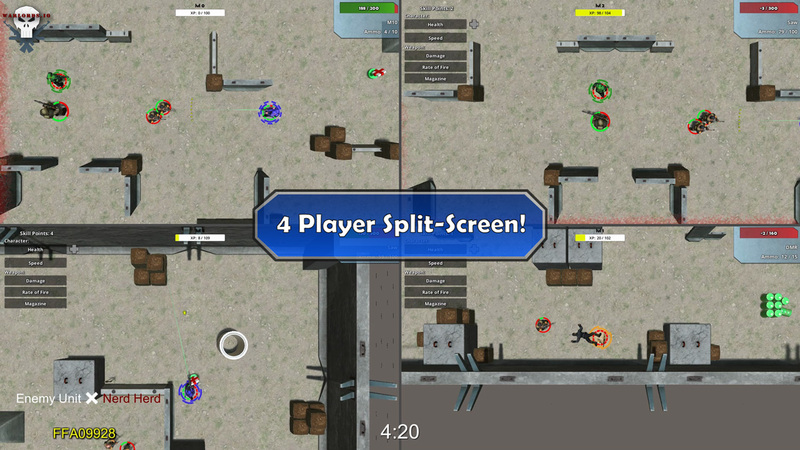 4 Player Split Screen in Casual and Cooperative modes! Too few of today's games lack one of the most important features that made games as popular as they are today; Split-Screen Gameplay! 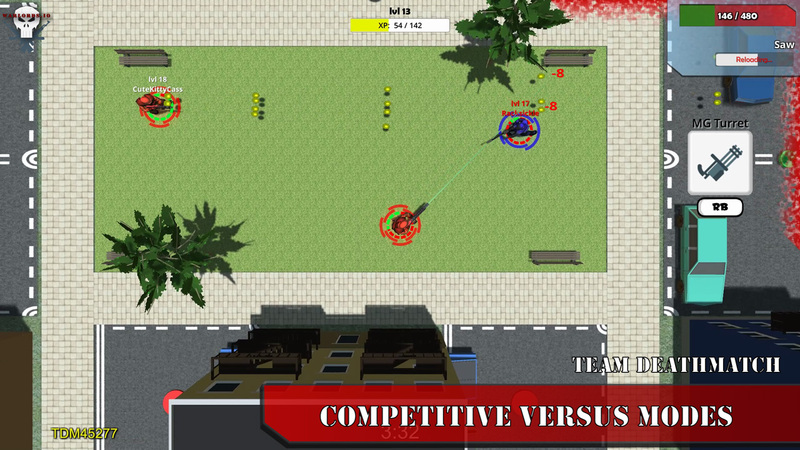 In Warlords.IO, players can have up to 4 players split-screen in most versus modes and all cooperative modes. Fight along side your friends on your couch in palm sweating co-operative modes that force you to play as a team, or trash talk your way to victory in versus modes. Still want to play with your friends even when they aren't in the same room as you? No Problem! Simply look for the Game ID in the bottom left corner of your screen and share it with them so they can join your game from any device, no matter which system you are playing on! Look for the Game ID in the bottom left of the screen! Defend the Base with your team, or die trying! Survival is the premier cooperative mode of Warlords.io. Lobbies of up to 8 players work together to defend 1 or multiple bases from an unlimited number of waves enemy hordes. 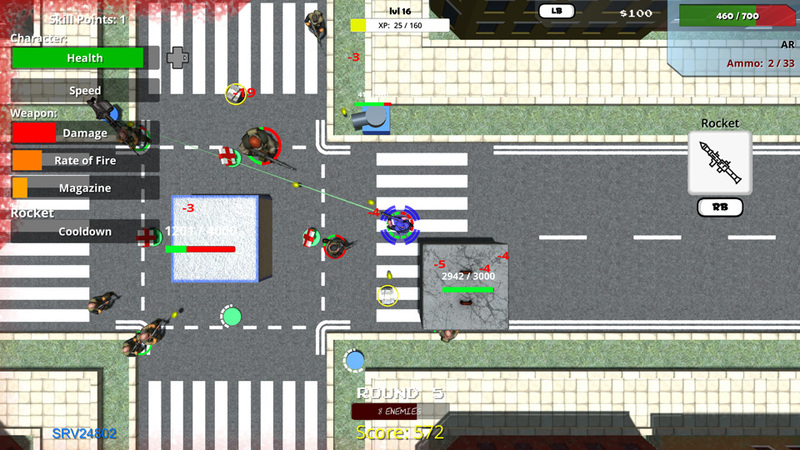 Waves of enemies continuously get larger and stronger as the game goes on. How long can you and your team survive? Warlords.io features several versus modes and a co-operative wave-based survival mode, all of which can be played together on any device. 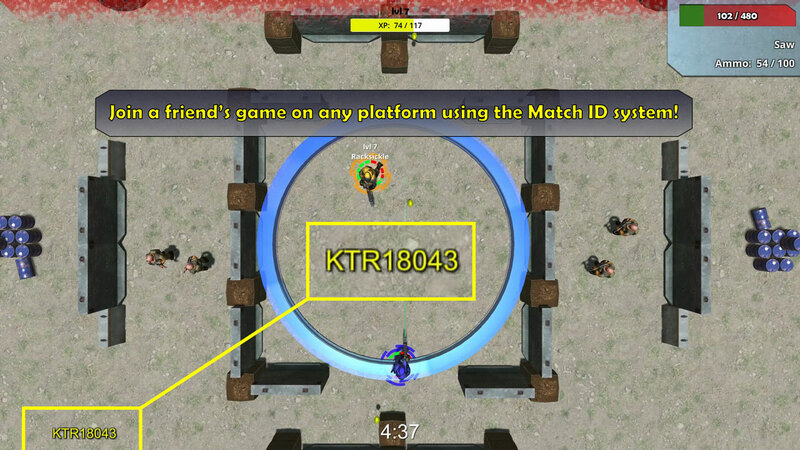 Warlords.io also features a special game mode that is rotated every month. These modes can be either a versus mode or co-operative mode, and might be a simple twists on base modes with tweaked player stats or a crazy random power weapons fiesta with 0 second cooldowns and quad damage and speed. See Gametypes and this months featured mode! Every character class has a selection of primary weapons unique to each class that are designed to fill that classes specific role. All classes have access to the same selection of secondary weapons that allow players to compliment their primary weapons and play style in any way they see fit. These weapons' Damage, Rate of Fire, and Magazine size can be upgraded during the match with player skill points as you level up! Most maps also feature at least 1 or multiple power weapon spawns. 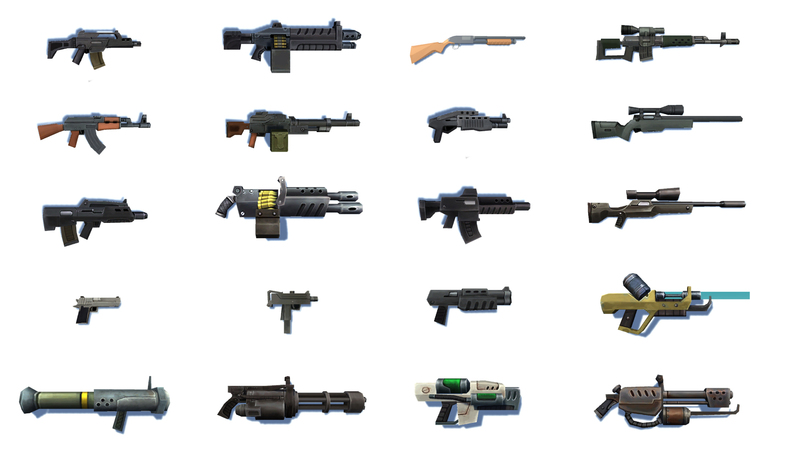 These weapons range from rocket launchers, to chainguns, to plasma rifles, and have unique mechanics to master before dealing serious damage! These weapons are unaffected by player weapon level stats but are much deadlier than base version of player starting weapons.